Not to be confused with Gaels or Gaul. A map of Gaul in the 1st century BC, showing the relative positions of its three tribes: Celtae (Galli), Belgae and Aquitani. The region corresponds to what is now Belgium, France, Switzerland, Netherlands, Western Germany and Northern Italy. The Gauls emerged around the 5th century BC as the bearers of the La Tène culture north of the Alps (spread across the lands between the Seine, Middle Rhine and upper Elbe). By the 4th century BC, they spread over much of what is now France, Belgium, Spain, Portugal, Switzerland, Southern Germany, Austria, the Czech Republic and Slovakia by virtue of controlling the trade routes along the river systems of the Rhône, Seine, Rhine, and Danube, and they quickly expanded into Northern Italy, the Balkans, Transylvania and Galatia. Gaul was never united under a single ruler or government, but the Gallic tribes were capable of uniting their forces in large-scale military operations. They reached the peak of their power in the early 3rd century BC. 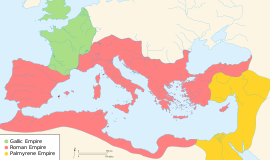 The rising Roman Republic after the end of the First Punic War increasingly put pressure on the Gallic sphere of influence; the Battle of Telamon of 225 BC heralded a gradual decline of Gallic power over the 2nd century, until the eventual conquest of Gaul in the Gallic Wars of the 50s BC. After this, Gaul became a province of the Roman Empire, and the Gauls culturally adapted to the Roman world, bringing about the formation of the hybrid Gallo-Roman culture. The Gauls of Gallia Celtica according to the testimony of Caesar called themselves Celtae in their own language (as distinct from Belgae and Aquitani), and Galli in Latin. As is not unusual with ancient ethnonyms, these names came to be applied more widely than their original sense, Celtae being the origin of the term Celts itself (in its modern meaning referring to all populations speaking a language of the "Celtic" branch of Indo-European) while Galli is the origin of the adjective Gallic, now referring to all of Gaul. The name Gaul itself is not derived from Latin Galli, but from the Germanic word *Walhaz (see Gaul). Gaulish culture developed out of the Celtic cultures over the first millennia BC. The Urnfield culture (c. 1300 BC – c. 750 BC) represents the Celts as a distinct cultural branch of the Indo-European-speaking people. The spread of iron working led to the Hallstatt culture in the 8th century BC; the Proto-Celtic may have been spoken around this time. The Hallstatt culture evolved into the La Tène culture in around the 5th century BC. The Greek and Etruscan civilizations and colonies began to influence the Gauls especially in the Mediterranean area. Gauls under Brennus invaded Rome circa 390 BC. By the 5th century BC, the tribes later called Gauls had migrated from Central France to the Mediterranean coast. Gallic invaders settled the Po Valley in the 4th century BC, defeated Roman forces in a battle under Brennus in 390 BC and raided Italy as far as Sicily. In the 3rd century BC, the Gauls attempted an eastward expansion in 281-279 BC, towards the Balkan peninsula, which at that time was a Greek province, with the ultimate goal to reach and loot the rich Greek city-states of the Greek mainland, but the majority of the Gaul army was exterminated by the Greeks and the few Gauls that survived were forced to flee. A large number of Gauls served in the armies of Carthage during the Punic Wars, and one of the leading rebel leaders of the Mercenary War, Autaritus, was of Gallic origin. During the Balkan expedition, led by Cerethrios, Brennos and Bolgios, the Gauls raided twice the Greek mainland. At the end of the second expedition the Gallic raiders had been repelled by the coalition armies of the various Greek city-states and were forced to retreat to Illyria and Thrace, but the Greeks were forced to grant safe-passage to the Gauls who then made their way to Asia Minor and settled in Central Anatolia. The Gallic area of settlement in Asia Minor was called Galatia; there they created widespread havoc. But they were checked through the use of war elephants and skirmishers by the Greek Seleucid king Antiochus I in 275 BC, after which they served as mercenaries across the whole Hellenistic Eastern Mediterranean, including Ptolemaic Egypt, where they, under Ptolemy II Philadelphus (285-246 BC), attempted to seize control of the kingdom. In the first Gallic invasion of Greece (279 BC), they achieved victory over the Macedonians and killed the Macedonian king Ptolemy Keraunos. They then focused on looting the rich Macedonian countryside, but avoided the heavily fortified cities. The Macedonian general Sosthenes assembled an army, defeated Bolgius and repelled the invading Gauls. In the second Gaulish invasion of Greece (278 BC), the Gauls, led by Brennos, suffered heavy losses while facing the Greek coalition army at Thermopylae, but helped by the Heracleans they followed the mountain path around Thermopylae to encircle the Greek army in the same way that the Persian army had done at the Battle of Thermopylae in 480 BC, but this time deafeating the whole of the Greek army. After passing Thermopylae the Gauls headed for the rich treasury at Delphi, where they were defeated by the re-assembled Greek army. This led to a series of retreats of the Gauls, with devastating losses, all the way up to Macedonia and then out of the Greek mainland. The major part of the Gaul army was defeated in the process, and those Gauls survived were forced to flee from Greece. The Gallic leader Brennos was seriously injured at Delphi and committed suicide there. (He is not to be confused with another Gaulish leader bearing the same name who had sacked Rome a century earlier (390 BC). In 278 BC Gaulish settlers in the Balkans were invited by Nicomedes I of Bithynia to help him in a dynastic struggle against his brother. They numbered about 10,000 fighting men and about the same number of women and children, divided into three tribes, Trocmi, Tolistobogii and Tectosages. They were eventually defeated by the Seleucid king Antiochus I (275 BC), in a battle in which the Seleucid war elephants shocked the Galatians. Although the momentum of the invasion was broken, the Galatians were by no means exterminated, and continued to demand tribute from the Hellenistic states of Anatolia to avoid war. 4,000 Galatians were hired as mercenaries by the Ptolemaic Egyptian king Ptolemy II Philadelphus in 270 BC. According to Pausanias, soon after arrival the Celts plotted “to seize Egypt”, and so Ptolemy marooned them on a deserted island in the Nile River. Galatians also participated at the victory at Raphia in 217 BC under Ptolemy IV Philopator, and continued to serve as mercenaries for the Ptolemaic dynasty until its demise in 30 BC. They sided with the renegade Seleucid prince Antiochus Hierax, who reigned in Asia Minor. Hierax tried to defeat king Attalus I of Pergamum (241–197 BC), but instead, the Hellenized cities united under Attalus's banner, and his armies inflicted a severe defeat upon the Galatians at the Battle of the Caecus River in 241 BC. After this defeat, the Galatians continued to be a serious threat to the states of Asia Minor. In fact, they continued to be a threat even after their defeat by Gnaeus Manlius Vulso in the Galatian War (189 BC). Galatia declined and at times fell under Pontic ascendancy. They were finally freed by the Mithridatic Wars, in which they supported Rome. In the settlement of 64 BC, Galatia became a client state of the Roman empire, the old constitution disappeared, and three chiefs (wrongly styled "tetrarchs") were appointed, one for each tribe. But this arrangement soon gave way before the ambition of one of these tetrarchs, Deiotarus, a contemporary of Cicero and Julius Caesar, who made himself master of the other two tetrarchies and was finally recognized by the Romans as 'king' of Galatia. The Galatian language continued to be spoken in central Anatolia until the 6th century. In the Second Punic War the famous Carthaginian general Hannibal Barca used Gallic mercenaries in his invasion of Italy. They played a part in some of his most spectacular victories, including the battle of Cannae. The Gauls were so prosperous by the 2nd century that the powerful Greek colony of Massilia had to appeal to the Roman Republic for defense against them. The Romans intervened in southern Gaul in 125 BC, and conquered the area eventually known as Gallia Narbonensis by 121. In 58 BC Julius Caesar launched the Gallic Wars and had conquered the whole of Gaul by 51 BC. He noted that the Gauls (Celtae) were one of the three primary peoples in the area, along with the Aquitanians and the Belgae. Caesar's motivation for the invasion seems to have been his need for gold to pay off his debts and for a successful military expedition to boost his political career. The people of Gaul could provide him with both. So much gold was looted from Gaul that after the war the price of gold fell by as much as 20%. While they were militarily just as brave as the Romans, the internal division between the Gallic tribes guaranteed an easy victory for Caesar, and Vercingetorix's attempt to unite the Gauls against Roman invasion came too late. After the annexation of Gaul a mixed Gallo-Roman culture began to emerge. The Gallic Empire (in green), under Tetricus I by 271 AD, included the territories of Germania, Gaul and Britannia. After more than a century of warfare, the Cisalpine Gauls were subdued by the Romans in the early 2nd century BC. The Transalpine Gauls continued to thrive for another century, and joined the Germanic Cimbri and Teutones in the Cimbrian War, where they defeated and killed a Roman consul at Burdigala in 107 BC, and later became prominent among the rebelling gladiators in the Third Servile War. The Gauls were finally conquered by Julius Caesar in the 50s BC despite a rebellion by the Arvernian chieftain Vercingetorix. During the Roman period the Gauls became assimilated into Gallo-Roman culture and by expanding Germanic tribes. During the crisis of the third century, there was briefly a breakaway Gallic Empire founded by the Batavian general Postumus. Jordanes, in his Origins and Deeds of the Goths, indirectly describes the Gauls as light-haired and large-bodied via comparing them to Caledonians, as a contrast to the Spaniards, who he compared to the Silures. He speculates based on this comparison that the Britons originated from different peoples, including the aforementioned Gauls and Spaniards. The Silures have swarthy features and are usually born with curly black hair, but the inhabitants of Caledonia have reddish hair and large loose-jointed bodies. They [the Britons] are like the Gauls and the Spaniards, according as they are opposite either nation. Hence some have supposed that from these lands the island received its inhabitants. In the novel Satyricon, written by Roman courtier Gaius Petronius, a Roman character sarcastically suggests that he and his partner "chalk our faces so that Gaul may claim us as her own" in the midst of a rant outlining the problems with his partner's plan of using blackface to impersonate Aethiopians. This suggests that Gauls were thought of on average to be much paler than Romans. All over Gaul, archeology has uncovered numerous pre-Roman gold mines (at least 200 in the Pyrenees), suggesting that they were very rich, also evidenced by large finds of gold coins and artefacts. Also there existed highly developed population centers, called oppida by Caesar, such as Bibracte, Gergovia, Avaricum, Alesia, Bibrax, Manching and others. Modern archeology strongly suggests that the countries of Gaul were quite civilized and very wealthy. Most had contact with Roman merchants and some, particularly those that were governed by Republics such as the Aedui, Helvetii and others, had enjoyed stable political alliances with Rome. They imported Mediterranean wine on an industrial scale, evidenced by large finds of wine vessels in digs all over Gaul, the largest and most famous of which being the one discovered in Vix Grave, which stands 1.63 m (5'4") in height. Celtic war trumpet named "carnyx" found in the Gallic sanctuary of Tintignac, Corrèze, France. Celtic bronze helmet in the shape of swan found in Tintignac, Corrèze, France. Gaulish society was dominated by the druid priestly class. The druids were not the only political force, however, and the early political system was complex. The fundamental unit of Gallic politics was the tribe, which itself consisted of one or more of what Caesar called "pagi". Each tribe had a council of elders, and initially a king. Later, the executive was an annually-elected magistrate. Among the Aedui tribe the executive held the title of "Vergobret", a position much like a king, but its powers were held in check by rules laid down by the council. The tribal groups, or pagi as the Romans called them (singular: pagus; the French word pays, "region", comes from this term) were organised into larger super-tribal groups that the Romans called civitates. These administrative groupings would be taken over by the Romans in their system of local control, and these civitates would also be the basis of France's eventual division into ecclesiastical bishoprics and dioceses, which would remain in place — with slight changes — until the French Revolution. Although the tribes were moderately stable political entities, Gaul as a whole tended to be politically divided, there being virtually no unity among the various tribes. Only during particularly trying times, such as the invasion of Caesar, could the Gauls unite under a single leader like Vercingetorix. Even then, however, the faction lines were clear. The Romans divided Gaul broadly into Provincia (the conquered area around the Mediterranean), and the northern Gallia Comata ("free Gaul" or "wooded Gaul"). Caesar divided the people of Gaulia Comata into three broad groups: the Aquitani; Galli (who in their own language were called Celtae); and Belgae. In the modern sense, Gaulish tribes are defined linguistically, as speakers of dialects of the Gaulish language. While the Aquitani were probably Vascons, the Belgae would thus probably be counted among the Gaulish tribes, perhaps with Germanic elements. All Gaul is divided into three parts, one of which the Belgae inhabit, the Aquitani another, whereas those who in their own language are called Celts and in ours Gauls, the third. The Garonne River separates the Gauls from the Aquitani; the River Marne and the River Seine separate them from the Belgae. Of all these, the Belgae are the bravest, because they are furthest from the civilisation and refinement of (our) Province, and merchants least frequently resort to them, and import those things which tend to effeminate the mind; and they are the nearest to the Germani, who dwell beyond the Rhine, with whom they are continually waging war; for which reason the Helvetii also surpass the rest of the Gauls in valour, as they contend with the Germani in almost daily battles, when they either repel them from their own territories, or themselves wage war on their frontiers. One part of these, which it has been said that the Gauls occupy, takes its beginning at the River Rhône; it is bounded by the River Garonne, the Atlantic Ocean, and the territories of the Belgae; it borders, too, on the side of the Sequani and the Helvetii, upon the River Rhine, and stretches toward the north. The Belgae rises from the extreme frontier of Gaul, extend to the lower part of the River Rhine; and look toward the north and the rising sun. Aquitania extends from the Garonne to the Pyrenees and to that part of the Atlantic (Bay of Biscay) which is near Spain: it looks between the setting of the sun, and the north star. Gaulish or Gallic is the name given to the Celtic language that was spoken in Gaul before the Latin of the late Roman Empire became dominant in Roman Gaul. According to Julius Caesar in his Commentaries on the Gallic War, it was one of three languages in Gaul, the others being Aquitanian and Belgic. In Gallia Transalpina, a Roman province by the time of Caesar, Latin was the language spoken since at least the previous century. Gaulish is paraphyletically grouped with Celtiberian, Lepontic, and Galatian as Continental Celtic. The Lepontic language and the Galatian language are sometimes considered to be dialects of Gaulish. The exact time of the final extinction of Gaulish is unknown, but it is estimated to have been around or shortly after the middle of the 1st millennium. Gaulish may have survived in some regions as the mid to late 6th century in France. Despite considerable Romanization of the local material culture, the Gaulish language is held to have survived and had coexisted with spoken Latin during the centuries of Roman rule of Gaul. Coexisting with Latin, Gaulish played a role in shaping the Vulgar Latin dialects that developed into French, with effects including loanwords and calques, sound changes shaped by Gaulish influence, and well as in conjugation and word order. Recent work in computational simulation suggests that Gaulish played a role in gender shifts of words in Early French, where by the gender would shift to match the gender of the corresponding Gaulish word with the same meaning. Their system of gods and goddesses was loose, there being certain deities which virtually every Gallic person worshiped, as well as tribal and household gods. Many of the major gods were related to Greek gods; the primary god worshiped at the time of the arrival of Caesar was Teutates, the Gallic equivalent of Mercury. The "father god" in Gallic worship was "Dis Pater". However, there is no record of a theology, just a set of related and evolving traditions of worship. Perhaps the most intriguing facet of Gallic religion is the practice of the Druids. There is no certainty concerning their origin, but it is clear that they vehemently guarded the secrets of their order and held sway over the people of Gaul. Indeed, they claimed the right to determine questions of war and peace, and thereby held an "international" status. In addition, the Druids monitored the religion of ordinary Gauls and were in charge of educating the aristocracy. They also practiced a form of excommunication from the assembly of worshippers, which in ancient Gaul meant a separation from secular society as well. Thus the Druids were an important part of Gallic society. After completing the conquest of Gaul, Rome converted most of these tribes into civitates, making for the administrative map of the Roman provinces of Gaul. This was then perpetuated by the early church, whose geographical subdivisions were based on those of late Roman Gaul, and lasted into the areas of French dioceses prior to the French Revolution. Vercingétorix Memorial in Alesia, near the village of Alise-Sainte-Reine, France. However, the dismissal of "Gaulish prehistory" as irrelevant for French national identity has been far from universal. Pre-Roman Gaul has been evoked as a template for French independence especially during the Third French Republic. An iconic phrase summarizing this view is that of "our ancestors the Gauls" (nos ancêtres les Gaulois), associated with the history textbook for schools by Ernest Lavisse (1842-1922), who taught that "the Romans established themselves in small numbers; the Franks were not numerous either, Clovis having but a few thousand men with him. The basis of our population has thus remained Gaulish. The Gauls are our ancestors." Astérix, the popular series of French comic books following the exploits of a village of "indomitable Gauls", satirizes this view by combining scenes set in classical antiquity with modern ethnic clichés of the French and other nations. Similarly, in Swiss national historiography of the 19th century, the Gaulish Helvetii were chosen as representing the ancestral Swiss population (compare Helvetia as national allegory), as the Helvetii had settled in both the French and the German-speaking parts of Switzerland, and their Gaulish language set them apart from Latin- and German-speaking populations in equal measure. ^ a b "Gaul (ancient region, Europe)". Encyclopædia Britannica Online. Encyclopædia Britannica, Inc. Retrieved 29 November 2012. ^ Pinault, Georges-Jean (2007). Gaulois et celtique continental (in French). Librairie Droz. p. 381. ISBN 9782600013376. ^ "Titus Livius (Livy), The History of Rome, Book 5, chapter 34". www.perseus.tufts.edu. Retrieved 2018-08-14. ^ a b Hinds, Kathryn (2009). Ancient Celts. Marshall Cavendish. p. 38. ISBN 978-1-4165-3205-7. ^ Scholten, Joseph Bernard (1987). Aetolian Foreign Relations During the Era of Expansion, Ca. 300 -217 B.C. University of California, Berkeley. p. 104. ^ Koch, John T. (2006). "Galatian language". In John T. Koch. Celtic culture: a historical encyclopedia. Volume III: G—L. Santa Barbara, California: ABC-CLIO. p. 788. ISBN 978-1-85109-440-0. Late classical sources—if they are to be trusted—suggest that it survived at least into the 6th century AD. ^ "France: The Roman conquest". Encyclopædia Britannica Online. Encyclopædia Britannica. Retrieved April 6, 2015. Because of chronic internal rivalries, Gallic resistance was easily broken, though Vercingetorix’s Great Rebellion of 52 bce had notable successes. ^ "Julius Caesar: The first triumvirate and the conquest of Gaul". Encyclopædia Britannica Online. Encyclopædia Britannica. Retrieved February 15, 2015. Indeed, the Gallic cavalry was probably superior to the Roman, horseman for horseman. Rome’s military superiority lay in its mastery of strategy, tactics, discipline, and military engineering. In Gaul, Rome also had the advantage of being able to deal separately with dozens of relatively small, independent, and uncooperative states. Caesar conquered these piecemeal, and the concerted attempt made by a number of them in 52 bce to shake off the Roman yoke came too late. ^ Strauss, Barry (2009). The Spartacus War. Simon and Schuster. pp. 21–22. ISBN 978-1-4165-3205-7. ^ Marcellinus, Ammianus (1862). The roman history of Ammianus Marcellinus: during the reigns of the emperors Constantius, Julian, Jovianus, Valentinian, and Valens, Volume 1. H. G. Bohn. p. 80. ISBN 9780141921501. Retrieved December 15, 2017. ^ James Bromwich. "The Roman Remains of Northern and Eastern France: A Guidebook." Page 341. Citing "Bibliotheca Historica," 5.28, 1-3. ^ Gaius Petronius, "Satyricon", 1st century AD, page 208. ^ Stifter, David (2012). "Old Celtic Languages (lecture notes)". University of Kopenhagen. p. 109. ^ a b Matasovic, Ranko (2007). "Insular Celtic as a Language Area". Papers from the Workship within the Framework of the XIII International Congress of Celtic Studies. The Celtic Languages in Contact: 106. ^ Adams, J. N. "Chapter V -- Regionalisms in provincial texts: Gaul". The Regional Diversification of Latin 200 BC – AD 600. Cambridge. p. 279–289. doi:10.1017/CBO9780511482977.06 (inactive 2019-02-09). ^ Les Romains qui vinrent s'établir en Gaule étaient en petit nombre. Les Francs n'étaient pas nombreux non plus, Clovis n'en avait que quelques milliers avec lui. Le fond de notre population est donc resté gaulois. Les Gaulois sont nos ancêtres. (cours moyen, p. 26). Look up Gaul in Wiktionary, the free dictionary. Look up Gallic in Wiktionary, the free dictionary. Look up Celtae in Wiktionary, the free dictionary. Wikimedia Commons has media related to Gauls.